Done In A Day: China Wraps Up Murder Trial Of Once-Prominent Politician's Wife : The Two-Way It took prosecutors about four hours to lay out their case against Gu Kailai. Officials say she didn't challenge the allegations. She will be sentenced later. As we said two weeks ago, China's state-controlled media had already concluded that Gu Kailai was guilty of murder even before any sort of a trial. 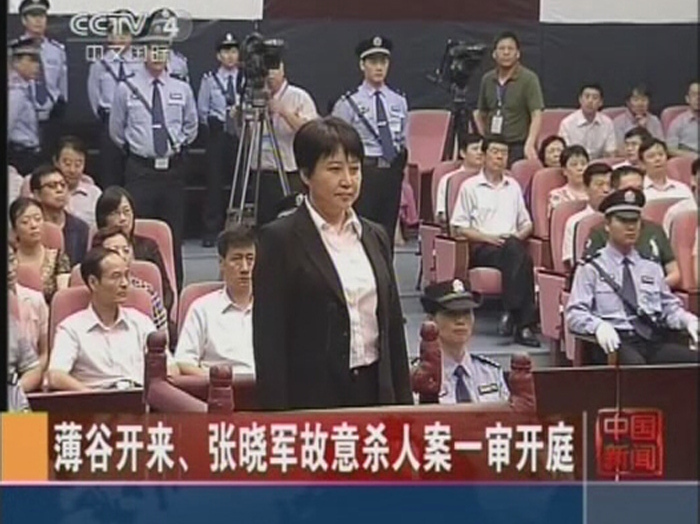 Today in central China the wife of once-prominent politician Bo Xilai got her day in court. In one day — actually, in about four hours — prosecutors presented their case and officials then announced that Gu and an aide did not contest the charge that they conspired to kill British businessman Neil Heywood last November because he had allegedly threatened Gu's son. The official guilty verdict and Gu's sentence will come later. She could be given a death sentence. On Morning Edition, NPR's Frank Langfitt talked with host Renee Montagne about the case and the "enormous political subtext" beneath it. Frank said Bo (the husband) has allegedly been confiscating the fortunes of businessmen in Chongqing, China, his former political stronghold. Bo was poised to this year ascend into the ranks of China's top leadership and it was feared by others that he might employ some of the same strongarm tactics on a broader scale. The case against Bo's wife, Frank said, "has allowed his political rivals to sideline him." Bo is now in detention. After a verdict is officially handed down against Gu, "the Communist Party will deal with him [Bo]," Frank told Renee. As for the murder charge, the BBC reports that in court today the prosecution said Gu lured Heywood to a hotel last Nov. 13. "After Heywood became intoxicated, vomited and asked for a drink of water, she poured a poison into his mouth that had been prepared beforehand and that she had given to [her aide] Zhang Xiaojun to bring along, causing Heywood's death," prosecutors alleged. Heywood had some business dealings with Bo and had been a friend of the Chinese couple's son. The exact nature of any falling out between Heywood and the family isn't clear.